Dr. De Oliveira is certified by the American Board of Surgery, the American Board of Thoracic Surgery, and the Royal College of Surgeons of Canada. His practice comprises all aspects of adult cardiothoracic surgery, with special interest in aortic aneurysms; aortic root reconstruction procedures; aortic valve sparing operations for aortic aneurysms; management of aortic pathology in Marfan Syndrome; adult congenital heart surgery; re-do cardiac surgery operations; management of complex infective endocarditis including intracardiac reconstructive procedures with double valve replacement and reconstruction of the intervalvular fibrous body; and adult heart and lung transplantation. Dr. De Oliveira provides a wide range of services including Angioplasty, Aortic Valve-Sparing Surgery, Atrial Septal Defect (ASD) Repair, Cardiac Resynchronization Therapy (CRT), Cardioversion, Carotid and Peripheral Blood Vessel Revascularization, Carotid Artery Stent, Carotid Surgery and Intervention, Cryoablation, Destination Therapy for End-Stage Heart Failure, Endoscopic Surveillance, Heart Bypass (Coronary Artery Bypass Graft Surgery – CABG), Implantable Cardioverter Defibrillators (ICDs), In Situ Vein Bypass for Limb Salvage, Limb Salvage, Lung Transplant, Maze Procedure (Surgical), Maze Procedure (Minimally Invasive), Mitral Valve Repair, Pacemakers, Patent Foramen Ovale (PFO) Closure, Photodynamic Therapy, Pulmonary Thrombectomy, Pulmonary Thromboendarterectomy, Radiofrequency Ablation (HALO), Renal Stenting, Robotic Cardiac Surgery, Stents (Drug-Eluting Stents), Surgical Ventricular Remodeling (SVR), Thoracic Aortic Aneurysm Repair (Endovascular Graft), Thoracic Aortic Aneurysm Repair (Open Surgical), Transmyocardial Laser Revascularization (TMR), Valve Repair or Replacement Surgery (Minimally Invasive), Vena Cava Filter, Ventricular Assist Devices. 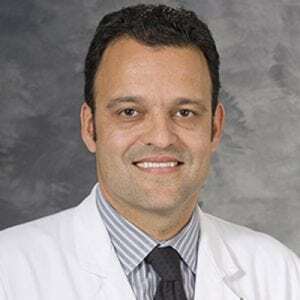 Dr. De Oliveira’s research interests include myocardial protection, intracardiac fibrous body anatomy and reconstructive procedures, infective endocarditis, effects of the new LAS score on lung transplantation, use of DCD donors lung donation and extended criteria organs, and ex vivo lung perfusion systems for donor lungs grafts recovery. Outcomes of surgical aortic valve replacement for mixed aortic valve disease. Natural history of the proximal aorta in patients with descending thoracic aortic disease. Cluster analysis of acute ascending aortic dissection provides novel insight into mechanisms of distal progression. Coronary Events in Patients Presenting for Repair of Acute Type A Aortic Dissection. Acute retrograde type A aortic dissection: morphologic analysis and clinical implications.